a little flat after several months of use...put a flatter pillow under and it works well. My husband sleeps mainly on his back and it cradles his head nicely. Cover washes up well and pillow fits in a standard pillow case. 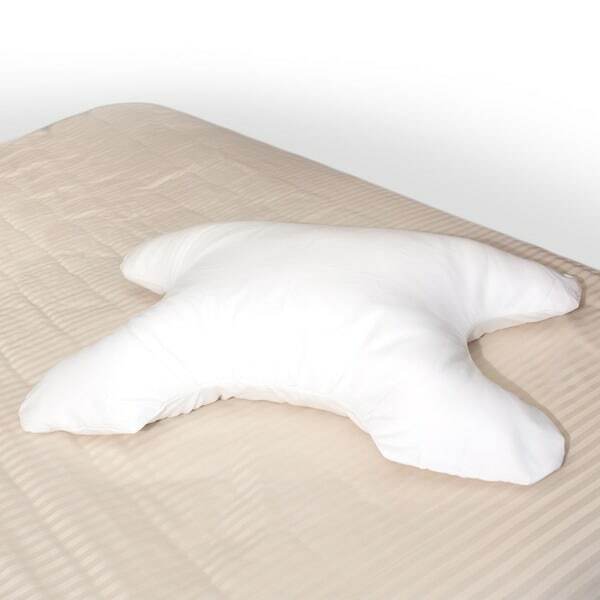 Get a good nights rest using this Science of Sleep SleePap pillow designed for CPAP users. No matter what type of sleeper you are, this specialty pillow keeps you comfortabe all night long. Specially designed for people who suffer from sleep apnea or other sleep disorders, this pillow helps hold the CPAP mask securely in place. Featuring voids on both sides to accommodate CPAP masks, it also helps to prevent leaks and ease pressure points. Feel the soft support of the hypoallergenic polyester fill as it cradles your head while you drift to sleep. Easily remove the polyester and cotton blend cover and wash in your washing machine for convenience. I would recommend this pillow for anybody who uses a cpap machine as the design is very accommodating for your mask and hose. For back sleepers like myself, the cutout design for the neck is very comfortable and the right height. I also have a bad neck so this is very important to me. When I sleep on my side the design of this pillow means I don't have to wrestle with making a regular pillow accommodate my hose. Also if you have a full face mask like myself, you know you have to leave the space above your nose free so that you don't block the air you exhale. The side cut-outs are very helpful here.People using cpap know how hard it is to wrestle with a regular rectangular pillow and try to shape it so your neck is supported when you sleep on your back, and then try to flatten it when you sleep on your side. This pillow makes all that a thing of the past.I was very pleased with the quality of this pillow and the price was reasonable to me. It comes with it's own pillow case so there is no need to struggle with a regular pillow case to get a good fit. for it. . Needless to say I have used this pillow every night since I got it a few weeks ago and I give it 5 stars for all the ratings above. I have had this pillow just about 2 months. Unless you can sew, I would not recommend it. While it did help me sleep at first now it has become compressed and lumpy. Also, I have had to cover it with a regular pillowcase because the one it comes with has fallen apart. after two washings.The regular pillow case works okay but defeats the purpose of the shape of the pillow. It is a great idea for CPAP users but too bad it is poorly made. The manufacuter will not replace it and a new case cost over $20. I won't buy another. After researching all the cpap pillows, I decided on the SleePap pillow. So far I am very happy with it. I am a side sleeper with obstructive sleep apnea and use the Resmed nasal pillow. The pillow is not very thick, but I like the fact that I can sleep with another pillow underneath and kind of move this one around. It is very comfortable and I would recommend to anyone that uses a cpap. Anything to help to make us more comfortable!! My father has to wear the mask at night and sleeps on his side and came across this quite by accident as had no idea they made a pillow to make it more comfy for side sleepers that need to use this device for sleep apnea. My father is rather stubborn, intelligent and a man of few words but just told me the other day he really appreciated me sending this to him and he uses it every night. My mother is an avid and savy sewer and will be making a custom pillow case for it. Thanks OS! This pillow is wonderful for CPAP users. Soft and comfortable to use. I bought this pillow thinking it would be as uncomfortable as the $65 CPAP memory foam pillow I had. Wow, was I wrong! This pillow actually conforms to the contours of your head and face, but still allows room for the mask and tubing. With other pillows, my mask was always smashed into my face, causing leaks. With this pillow, I can roll over, sleep on my side (I'm a big side sleeper) and sleep on my back without "mask mash". We traveled over the holidays and I made sure I brought this pillow - well worth it! The pillow is very fluffy at first, but after a month or so, the it begins to get a little flat. I'm going to run it through the fluff cycle of the dryer to plump it up a bit. I agree about the stiffness of the pillowcase. It is pretty coarse and stiff. I just placed the pillow in a regular king sized pillow case and it works like a charm - nice and soft! I'll be buying another to have as a travel spare! Bought this product for my husband who wrestled with "regular" pillows while using the CPAP machine. He loves this pillow! Would recommend to anyone using the CPAP machine for greater comfort. Great pillow for side sleepers who use a full CPAP mask. The pillow cut aways prevent the mask from pushing against the pillow and breaking seal with face. Allows less mask strap tension promoting better sleep. Just the right neck and head support. We plan to order another SleePap Pillow for my wife. I had a hard time using a CPAP with a conventional pillow. The tubing would get caught when I would turn my head from the side to back or vice versa. With the SleepPap pillow, they have openings at the side for the tubing for you to freely move your head around. I can finally sleep on my side with the CPAP on. Great product! When asked how he likes his pillow (for use with his CPAP) my husband of 48 years responded, "I like it." For him that's high praise. He rarely uses gifts he hasn't requested, but this is a hit! We cover it with a traditional pillowcase for sanitation. There's no need for a structured duplicate of the one included. My husband really likes this pillow. He has one already and I purchased a second one for him. He says that is is very comfortable. This worked well for my husband until his ALS progressed to the point where he needed different positioning. It is much harder than the one I tried in the store, the center is billed up and does not help with my CPAP. Water off money. I did not like this pillow. Too small, it swims in a std size pillow case. Bought this for my snoring husband and he loves it. I purchased the Pillow for CPAP for my adult son who has sleep apnea. He reports that the pillow works well for him. Bought this a few years ago for my husband who uses a CPAP. He loves it. it seems like a comfortable pillow. It works very well with my mask! "Can you buy extra pillow case for this pillow?"